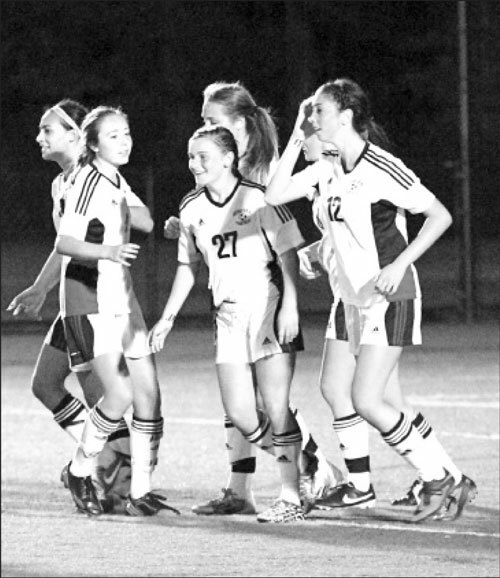 Teammates including Taylor Robertson (12) congratulate Eve Montgomery (27) on her goal against Plymouth North Sept. 23. Below, Alexis Fruzetti drives toward the goal. The girls’ soccer team survived a tough week playing to draws against both Scituate and Weymouth before wrapping up the week with a thrilling 3-1 come from behind win at Plymouth North. After a scoreless first half, Plymouth North took a 1-0 lead 5 mins in to the second half. Alexis Fruzzetti tied the score when she took a Katie Korzec pass and floated a shot over the keeper. Later Fruzzetti sent freshman Eve Montgomery towards the goal which she placed in the corner and gave Whitman Hanson a 2-1 lead. With two minutes remaining junior Rachel Kelley took a Fruzzetti pass and fired a low shot into the corner for the final 3-1 score. Elana Wood, Kelsey Gilbert, Jill Shangold and Katherine O’Kane all played strong defense in front of keeper Arianna Comendul who made 9 saves in goal. Taylor Kofton played a strong game in the middle of the field. The Lady Panthers started off a new week by defeating Quincy 4-1 Monday, Sept. 30. Casey Corr, Elana Wood, Taylor Robertson and Lauren Bonavita all recorded single tallies. Katie Korzec, Katherine O’kane, Taylor Kofton and Kelsey Gilbert all had strong games. Arianna Comendul recorded 3 saves in the Whitman Hanson net.